VW may have been slow to adopt electric technology, but as ever when the German giant sets its mind to something the results are usually impressive. 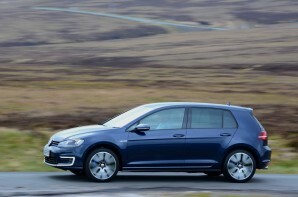 The Golf GTE provides an alternative to the pure electric e-Golf for those that are after a short electric range with the convenience of petrol power for longer journeys. The petrol engine in question is the 1.4 litre 150 PS 4 cylinder TSI turbocharged unit which endows the Golf with sprightly performance. However in the GTE it is backed up by a 100 bhp electric motor which is capable of powering the Golf alone for up to 30 miles. In reality you will get between 15 – 25 miles between plug-ins depending on the season and route. When both systems are operating together straight line performance warrants the GT prefix with a sub 8 second 0-62 mph time. It also rides and handles very well too, and despite a lot of shared hardware with the plug-in hybrid Audi A3, the Golf is the more entertaining of the pair. The swift shifting 6 speed DSG gearbox suits the VW’s clinical character and provides a good alternative to a CVT. Unfortunately the current fuel consumption tests don’t work for plug-in hybrids. If you travel less than the electric range then you will use no petrol at all. However once the engine wakes up something around mid 40’s to mid 50’s mpg is more realistic. This is a good real world result but you may feel short changed if you are expecting 166 mpg….. The GTE can offer petrol free commuting with the convenience of conventional power for longer journeys whilst also delivering a slice of fun when the mood and road align. However in the best tradition of VW, it is a tad pricey.